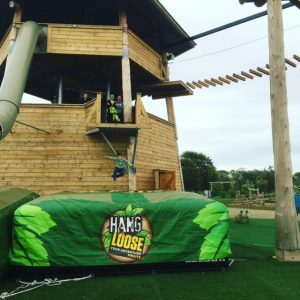 Let Loose is the new family attraction in Beverley, located next to Beverley Garden Centre on the Woodmansey Road between Beverley and Hull. They opened recently and I was delighted to be asked to go and have a look around with my 2 little ones. It’s a real hidden gem. You can’t see much from the road but as you pull up the driveway my children’s first impressions were ‘Wow! Is that where we’re going! ?’ There is a (very!) high rope course set up around the site and a lower ropes course underneath, plus a giant air bag that you can jump onto, the Big Leap, or drop down a huge slide onto, the Super Slide. 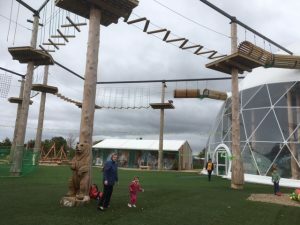 There’s a great outdoor play area and an indoor dome which has a good sized soft play and inflatables, as well as some of the ropes course. Owner Beatrice explained to me that the idea was to have somewhere that all the family can do activities, where grown ups can play too alongside their children, so that’s exactly what we did. We got started on the the low ropes course. The low ropes have a minimum age requirement of 7 and a minimum height of 1.2 metres, with an exception for ages 5-6 that if they meet the height requirement they can take part if they are accompanied by an adult. So my 1.3 metre 6 year old went up, accompanied by me! We had a very good, thorough safety briefing and were taken straight up by Ed. He showed us how to clip on and get around, he was really enthusiastic and when we’d got used to it he started showing my son a few extra fun ways of doing each obstacle. 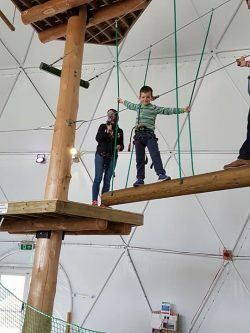 All of the low ropes course is inside the dome so my 3 year old watched with my husband from the soft play beneath and cheered us on. My son went round lots of times and had a great time, we had to bribe him down with a hot chocolate and cake! We all then played inside in the dome’s soft play area and inflatable then went outside to the play area. 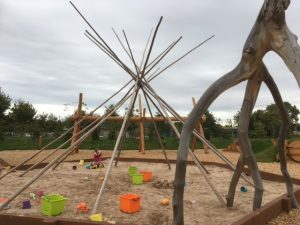 It’s a beautiful area, the outdoor equipment is very well designed and incorporates recycled and sustainably sourced materials. The turf at the site used to be Arsenal football clubs pitch! There is a fort, lots of log structures to climb and a large sandpit. My 3 year old loved the sand and wouldn’t come out even when it started to rain. After enough stalling it was time to tackle the high ropes. High ropes have a height requirement of 1.4 metres and minimum age of 10 years, so it looked like mummy was testing this one out! My mum was visiting for the weekend and had come along too so she looked after my children in the outdoor play area while me and my husband braved the high ropes together. It was quite scary, especially at first, but I got into the swing of it and tried to not look down. The team were excellent, we were shown how to use the course and were very securely attached so any slip and we would just hang in our harnesses. Except for a small wobble when I got completely tangled up, I got around the course and felt a huge sense of achievement. It was a really great activity to do with my husband, it would make a great ‘date day’ or birthday gift, as we encouraged each other around and had fun together without the kids. I also scored major ‘cool mum’ points with my 6 year old who was very impressed that I’d gone up. Feeling brave we all then took turns on the giant airbag jump, which is a lot higher up than it looks when you’re on the platform waiting to go! Only daddy braved the slide drop. There is also a fantastic cafe. We went in it for lunch and, as the food was so good and reasonably priced, we went back for snacks later. We had a fabulous day and ended up spending over 4 hours there doing various activities and just playing. There’s a minimal charge to go in and just use the soft play and outdoor play area of £3 for 1-5 years, £5 for 5-16 years, £2 for adults and 0-1 years are free. This is included if you book any of the activities available (high ropes, low ropes or big leap and super slides). It’s a great attraction to have in our area, to do the ropes course as a family activity or just to go in and use it as a place to meet friends. 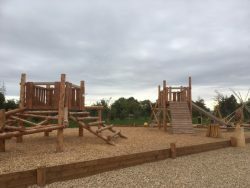 It makes a great alternative meet up place rather than a traditional soft play or playground, and its in a handy location for both Hull, Beverley and surrounding areas. My husband also said it’s one of the best places he’s ever taken the kids so we’ll certainly be back soon. So overall a big thumbs up for Let Loose! Its open Wednesday to Sunday from 10am term time and every day in school holidays (times and days may change though so do call ahead to check before going). As well as going to do the activities with your children, or just having a play date, they also run children’s parties and do group bookings for grown ups, such as corporate events. Find more about them and book activities on their website here, follow them on facebook here or call them on 01482 843475.